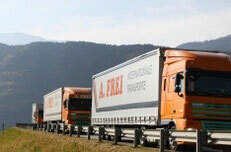 Do you need in a short time a transport of a big load or a trailer at your disposal for a few days? Our flexible structures and our own park of means of transport make it possible. Our units of different capacity, canvas and refrigerated trailers meet all requirements of environmental protection and guarantee reliable services. A professional driver picks the load from you and delivers it in accordance with your directions so that your customer gets it on time. Behind this process there is a proved organisation which creates best possible transport solutions appropriate for a given situation and goods.